1.) 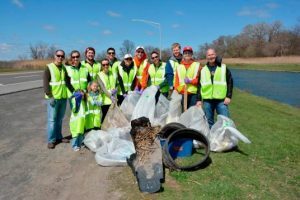 Combat Litter – Organize a litter cleanup with your community group. Try starting in your neighborhood and then expand from there! Energy and care for our community are contagious – you might just spark someone else to follow in your footsteps. It is important to keep litter off our streets because rain storms can wash this pollution into surrounding bodies of water, including Onondaga Lake. Check out our Connect the Drops program for more information! 2.) 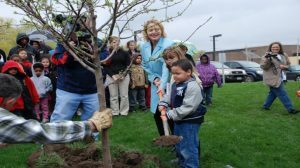 Plant trees – Volunteer groups can join Onondaga Earth Corps, Cornell Cooperative Extension and Save the Rain in planting trees in our community! There are multiple planting events throughout the Spring and Fall. Trees are planted in City parks and along City streets. So far we have planted over 7,500 trees in the City of Syracuse! Stay up to date on planting events by checking the calendar on the homepage of this site and also be sure to follow us on social media! Did you know that you can request a tree of your own? 3.) Get to Know Your Neighbors – The best way for good ideas and energy to spread is to talk about them! For example, lawns take a lot of energy and in some cases, fertilizer to maintain. They are also not great at soaking up rain water. One way to greatly increase the storage capacity of your block is to get together with your neighbors and discuss your thoughts about low impact lawns! Low impact lawns are lush and full of plants (native plants are ideal) and require minimal maintenance. Of course, you can opt to plant this type of lawn at your home regardless of what your neighbors decide, but idea sharing is a great way to support one another and beautify your neighborhood. 4.) Clean Water Fair – The County Department of Water and Environment Protection hosts the Clean Water Fair every September! This event allows members of the community to take a full tour of the Metro Treatment Plant and learn how a wastewater treatment plant operates. The Clean Water Fair also offers family friendly activities, green infrastructure displays, wildlife from Onondaga Lake and much more!